説明: Windows Media Player 10 for Windows 2000. Describe: Windows Media Player 10 for Windows 2000. If advapi32 and rp4crt exists then run UMDF. 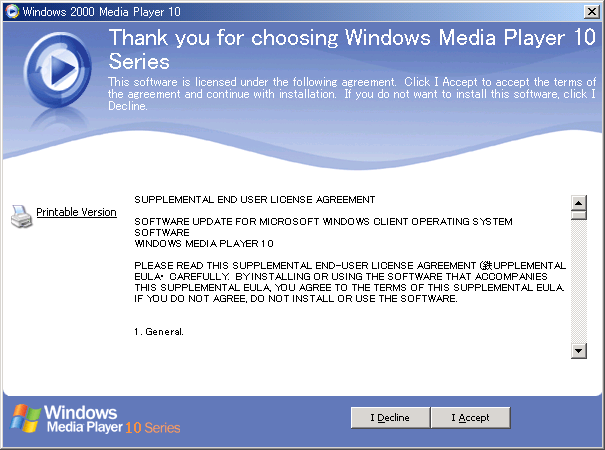 You can't completely uninstall WMP10, but when you run it again, You select 'Ok' after dialog box "Detect Media Player 10, Delete it and continue ? ", and cancel to install. It makes available to install WMP 7 or 9 again. Changed point from Build4058 to 4063 is following. * Fix overwrite registration ocx and dll. * Add function upgrade msvcrt.dll. * Simplized catalog file installer. * Release registration when uninstall. * Add function check installer locked status. Changed point from Build4063 to 4063a. * Fixed to be mixed inf file other countries. Changed point from Build4063a to 4063b. * Fix fail to register component. Changed point from Build4063b to 4063c. * Fix to fail component to register. Changed point from Build4063c to 4063d. * Apply KB895181 and kb911564. * Fix error English version. Changed point to Build 4063e. * Make to be able to use expand tag editor and extend plugin. Changed point to Build 4064. Changed point to Build 4065. Descreva: Windows Media Player 10 para o Windows 2000. Exija: gdiplus.dll, KDW' s kernel32.dll, user32.dll, shell32.dll, uxtheme.dll se advapi32 e rp4crt existem então o funcionamento UMDF. I only have one question. Can you tell my why wmp10 shows up in gray/black after the installation? Because in xp it shows up in blue. Because I use customized WMP9 pre-Installer which is gray/blue. (X) Setup is currently unable to detect available updates. Please try again later.